Would allowing TRIA to expire increase or decrease the amount that taxpayers would pay in the event of a terrorist attack? 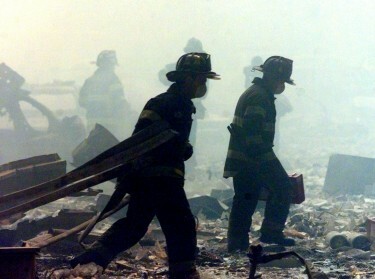 Congress enacted the Terrorism Risk Insurance Act (TRIA) in 2002, in response to terrorism insurance becoming unavailable or, when offered, extremely costly in the wake of the 9/11 attacks. The law creates an incentive for a functioning private terrorism insurance market by providing a government reinsurance backstop for catastrophic terrorist attack losses. Extended first in 2005 and again in 2007, TRIA is set to expire at the end of 2014, and Congress is again considering the appropriate government role in terrorism insurance markets. This policy brief examines the potential federal spending implications of allowing TRIA to expire. 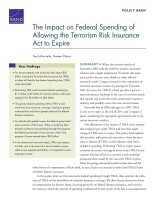 Combining information on federal spending through TRIA, the influence of TRIA on the availability of terrorism insurance coverage, and the relationship between uninsured losses and federal disaster assistance spending, the authors find that, in the absence of a terrorist attack, TRIA costs taxpayers relatively little, and in the event of a terrorist attack comparable to any experienced before, it is expected to save taxpayers money. For terrorist attacks with losses less than about $50 billion, having the Terrorism Risk Insurance Act (TRIA) in place will lead to less federal spending than if TRIA were eliminated. Eliminating TRIA could increase federal spending by $1.5 billion to $7 billion for terrorist attacks with losses ranging from $14 billion to $26 billion. For attacks with greater losses, the federal government pays a portion of the losses. When considering both disaster assistance and spending through the program, the federal government would pay less without the program if losses exceed about $50 billion. In the absence of a terrorist attack, TRIA costs taxpayers little, and in the event of a terrorist attack comparable to any experienced before, it is expected to save taxpayers money. The research described in this report was conducted within the Center for Catastrophic Risk Management and Compensation. The center is part of RAND Justice, Infrastructure, and Environment, a division of the RAND Corporation. LaTourrette, Tom and Noreen Clancy, The Impact on Federal Spending of Allowing the Terrorism Risk Insurance Act to Expire. Santa Monica, CA: RAND Corporation, 2014. https://www.rand.org/pubs/research_reports/RR611.html. Also available in print form.